After the game on July 9th, some of the old boys remarked that they couldn’t remember the last time Lugi had beaten Malmö. A decade. Perhaps more. It’s been a long time and sometimes the force of habit can be tough to break. Last year, we brought nine players to a game against Malmö. You can imagine how that turned out. In the match earlier this year, our lead was taken from us as the game neared its final whistle. We have come a long way since then. With one exception, everyone who took to the park on Saturday was a permanent resident of Sweden. We beat Malmö, seven tries to one, without the help of our exchange students. That is a phenomenal achievement. Consistency and hard work at training has recently allowed a lot of players to take a big step-up in their rugby. This was clearly evident on the 9th with everyone playing their part. Rather than go through the game minute-by-minute, I’m going to draw inspiration from the ladies’ match reports, and instead weave the day’s narrative by moving through the stories of the individual lugi lions themselves. I hope that this will give a good indication of the performances that contributed to the win – as well, perhaps, the need in future to respond more quickly as a team. This entry was posted in Match Report, Men's Team, News on July 29, 2011 by Jim. The fourth chapter of our 2011 season took place in Bromma on a very, very warm Saturday. It is the story of how we arrived at the pitch well prepared mentally, longing to play our first 15 a side game in over a month. When the starting whistle blew we were all on the pitch as one, united by our love for the game and each other. This feeling grew all through the game and no matter what happened we never lost the love. The match was very even to begin with, we made breakthroughs that were stopped by Attila and they made breakthroughs that we stopped. What made the big difference in the end was our lack of ability to read the game, support each other properly and our sloppy rucking. We also made a lot of silly handling errors with the ball. Not that we didn’t try to do it the proper and match winning way, we simply haven’t got enough players with enough experience yet, but we all learned a lot from this game and I’m certain that we will get better for every game we play. This entry was posted in Match Report, News, Women's Team on July 11, 2011 by admin. This Saturday and Sunday are gonna be big. Seventeen players from the ladies team are leaving for Stockholm tonight for a double header against Attila and Enköping. Enköping had always been a very strong team and Attila seems to really have picked up their game this season. Lugi ladies are going to focus on bringing their fearless 7s spirit into the 15-a side game and really get the team working as a unit. It will also be a fun social weekend with bbq and kubb planned for the Saturday. The gents come up against our greatest foe Malmö. After a close fought loss in mid-May, we will be hoping to use the home ground advantage to turn the score around. It will, no doubt, be a ferocious battle with the winner securing bragging rights and top position on the table. Players meet at the club at 1330. Kickoff is at 1500. There will be some pasta and celebratory drinks after the game before we head into Malmö for a night on the town. On Monday naprapat David Havia will be at the club from 1745 to look over aches and injuries. Find out more about David at his company’s website: http://www.lundsnaprapatklinik.se. This entry was posted in Management, Men's Team, News, Women's Team on July 8, 2011 by Jim. 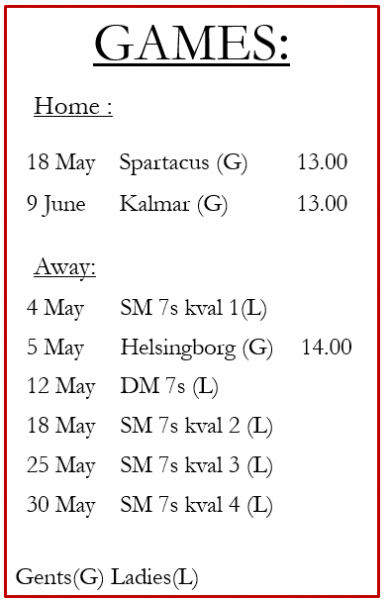 Fancy playing rugby in Sweden? If you are coming to Lund in Autumn 2011 then the Lugi Lions clubhouse will be a great place for you to play rugby, keep fit and have fun – an environment in which Swedes and exchange students mix freely. The Lugi Lions Rugby Club has both men’s and women’s teams. We typically train twice a week, play a couple of times a month and work at some the biggest concerts in nearby Malmö: Rammstein, The Eagles, Elton John, Lady Gaga, anyone? We cater to all backgrounds and levels of experience. We have beginners, non-Swedes who have played for many years in their own country as well as Swedes who have represented their country. It was a Friday morning and a team of twelve players and two coaches entered Halmstad, this years host city of the 7 a side Swedish championships. The weather was good, cloudy but warm and almost no wind at all. In swedish we call it ”riktig svenskt sommarväder”. The team consisted of Malin Olofsson, Martina Vivlund. Emmy Westerdahl, Mia-Maria Nordlund, Anna Thynell, Anne Franzén, Gabriella Westerdahl, Teresia Bengtsson, Caroline Lindberg, Louise Ericsäter, coach Stefan Tunfors and assistant coach Kerstin Lövendahl, the dream team if you ask us. This match report is going to be a little bit different from the previouse ones. This time the story is going to be told by two of the newest members of the ladies team. Not only are we going to tell you the story about how we came together as a team but also how we recaptured the spirit of the game, had plenty of fun and played some top quality rugby. We are also going to tell you our personal views of the two days, the view through the eyes of our two beginners and combine it with details that our assistant coach, Kerstin Lövendahl, wanted to share. This entry was posted in Match Report, News, Women's Team on July 7, 2011 by Martina.